When the Lake Superior and Mississippi Railroad from St. Paul to Duluth was completed in 1870, the LS&M along with the Northern Pacific railroad—both owned by Jay Cooke—built a passenger depot along 5th Avenue below Michigan Street. It was a simple, two-story wood-frame building with just two rooms on the main floor called the Union Depot because it served more than one railroad. It was all Duluth really needed, especially after Cooke ran out of money and his railroads were reorganized by others. The LS&M reemerged as the St. Paul & Duluth. As Duluth slowly pulled itself out of the depression left in the wake of Cooke’s financial disaster, more and more railroads began serving Duluth. Thanks to the grain and lumber trades, Duluth boomed in the 1880s, creating more need for rail service as immigrant laborers poured in by the thousands. By 1889, the original Union Depot was simply not enough to serve Duluth’s need for a larger passenger station. Perhaps the construction had slowed while the architect’s plans were being revised. A new design eliminated the central clock tower and its “Duluth” statue, but the plan remained elaborate, patterned after a French Norman-style chateau: steeped roofs, heavy round towers, and dormers. It was faced with yellow brick, limestone, sandstone, and granite. The three-story building—not including the train shed—was 203 feet long and 70 feet wide, much smaller than the first design. The Michigan Street level led to the train shed and contained mechanical rooms, baggage storage, and a waiting room for immigrants. The Superior Street level held a large central “general waiting” room, a smoking room, a barber shop, a gentlemen’s toilet, a ladies’ waiting room, a Western Union telegraph office, and a ticket office. A fruit and news stand was established next to the main entrance. The top floor contained offices used by the various railroads. A 16-foot wide granite stairway led from the Superior Street level to the Michigan Street level in a anticipation of the large crowds of people who would be using the terminal. Construction took nearly two years, and cost $615,000. The train shed—410 feet long and 120 feet wide—was built over the 1870 Union Depot. After the depot officials moved their offices into the new building on October 15, 1891, the 1870 depot was dismantled and carried away. The same newspaper that called the old depot “disgraceful” wrote that the old depot “gave more joy to the then residents [of Duluth] then does perhaps the magnificent new union depot that is to supersede it,” and noted that “the life of the old house measures the life of Duluth.” Its construction heralded great things for the future of the city. Like the old depot, it added, the new depot is a symbol of growth to come. Officials promised that that new depot would be open by December. Indeed, the tracks were in place by December 8. But as the year ended, Depot officials reported there was still a lot of work to be done before the railroads could move in and the depot would be open for service. The trains kept running throughout this time, with no depot operating. Although we could find no record of the event, some researchers believe the first “official” train to depart the new Depot did so in March 1892. The Union Depot was built for passenger service; the railroads had freight depots all over town. So the depot brought together people from all walks of life, from wealthy lumber barons and mining executives (some with private cars) to average working stiff to newly arrived immigrants, most of whom could not read, write, or speak English—the union must have sounded like the proverbial Tower of Babel. Many of these immigrants had been recruited in their homelands to operate commercial fishing boats on Lake Superior or to mine or on the Mesabi or Vermilion Range; many more came to better their lives and began life in America working as unskilled laborers in Duluth’s mills and on its coal and ore docks. By 1900, 26 trains a day passed through the depot. At its peak the Duluth Union Depot handled sixty trains every day. But as automobiles became more popular and highways were built, train travel began to decline. It was further affected after the second world war, with the birth of passenger airplane service. By the 1960s, passenger service had all but disappeared throughout the country. According to the North Shore Scenic Railway, “In the winter of 1969 a lone BUDD Rail Diesel Car with less than ten people on board departed Duluth’s Union Depot on its final run to meet the Northern Pacific’s North Coast Limited in Staples, Minnesota, for the latter’s run to the West Coast. None of the people on board that train would continue on, they just wanted to say they were the last to ride a passenger train out of Duluth. Before Amtrak temporarily returned rail passenger service in 1974, there was a local movement to create a cultural center for St. Louis County, a place that would house art, cultural, and historic organizations rent free under one roof—the St. Louis County Heritage & Arts Center. But where to house it? Duluth had two empty passenger depots—both slated for demolition—that seemed like likely candidates: the Union Depot and the 1910 Soo Line Depot just a block west on Superior Street. The Soo Line’s neoclassical depot was chosen for the center, but upon further inspection it was discovered that the building’s lower level was flooded with water and the integrity of its structure was severely compromised. Instead, the 1892 Union Depot was saved. In 1971 it was placed on the National Register of Historic Places and in 1974 it was converted to the St. Louis County Heritage & Arts Center through a $4.7 million renovation and restoration. 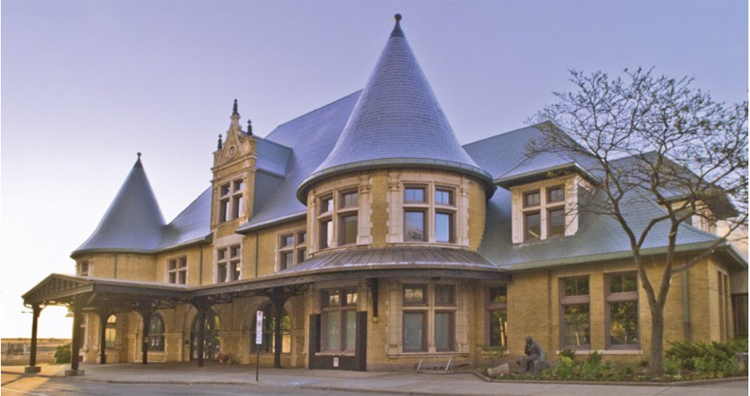 The building houses the Duluth Art Institute, the Lake Superior Railroad Museum, the North Shore Scenic Railroad, the Duluth Playhouse, the St. Louis County Historical Society, and other culture-related groups as well as the Duluth Depot Foundation, the center’s governing board. And chances are the Union Depot will once again serve as a passenger train terminal if current plans go through for the Northern Lights Express, a “higher-speed” rail service planned between Duluth/Superior and Minneapolis/St. Paul.